"A dinner for two featuring pan-cooked chicken breasts topped with sauteed mushrooms and melted cheese." Heat the olive oil in a skillet over medium heat. Place chicken in the skillet, and season with garlic powder and garlic. Cook 12 minutes on each side, or until juices run clear. Set chicken aside, and keep warm. Stir mushrooms into the skillet, and cook until tender. 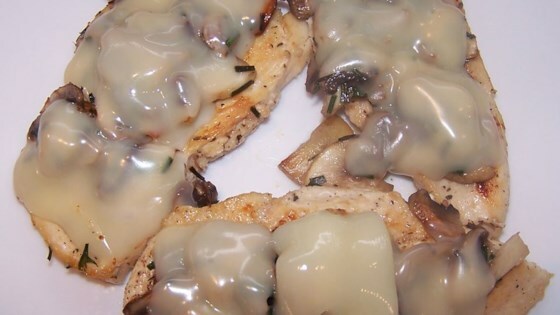 Return chicken to skillet, layer with mushrooms, and top with cheese. Cover skillet, and continue cooking 5 minutes, or until cheese is melted. This had absolutely no flavor! I even added extra garlic and some spices, but I think the juices from the chicken dilute the potency and flavor of the spices. I will not be making this again. I thought this was very tasty and easy. I took the advice of another reviewer and added fresh basil and parsley. I think that really made a difference.